Sourav Ganguly will have to play a big role as an opener to enable India win the Cricket World Cup in the West Indies beginning next month, former captain Sunil Gavaskar said here today. “I wish Ganguly gets more success from the game. 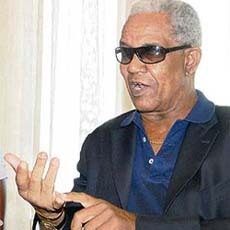 With the Caribbean set to stage the ninth edition of the cricket World Cup from next month, legendary West Indian all-rounder Garfield Sobers said the host country had the best chance to win the coveted trophy. Kirmani defends Sehwag's inclusion in WC squad. It turned out to be the same old story for Gagandeep Singh. The name of the Punjab bowling spearhead was not there in the North Zone team announced yesterday for the Deodhar Trophy. Gagandeep was easily the most consistent seamer from North Zone. Wimbledon will pay women and men equal prize money for the first time at this year’s grasscourt grand slam, All England Club chairman Tim Phillips said today. The tournament broke with its age old tradition to join the Australian and US Opens in paying equal prize money across the board in all events and in all stages of competition. “This year the committee decided unanimously that time was right to move to equal prize money and bring to a close a long progression,” Phillips told a news conference. Putting their best foot forward, Chandigarh Dynamos got the better of Hyderabad Sultans 2-0 in the second leg of the Premier Hockey League at the Sector 42 Hockey Stadium here tonight. Viswanathan Anand warded off stiff resistance from Russian GM Alexander Morozevich for his second successive win, propelling him to sole lead after the fourth round of the Morelia/Linares Super GM tournament here. Over 60 golfers from Punjab, Haryana, Rajasthan, Himachal, J&K and Chandigarh will converge on the greens of the Chandigarh Golf Club for the second North Zone Civil Services Golf Championship to be held on February 24. Senior Secondary Model School, Punjabi University, organised its 31st annual athletics meet here today. Director sports Raj Kumar Sharma was the chief guest. The meet began with unfurling of the school flag by the chief guest. Sourav Ganguly will have to play a big role as an opener to enable India win the Cricket World Cup in the West Indies beginning next month, former captain Sunil Gavaskar said here today. “I wish Ganguly gets more success from the game. I wish you (Ganguly) succeed particularly in the next few weeks when India will depend on you for giving the kind of start they need to bring back the Cup,” Gavaskar said at a book release function, where the left hander was also present. “Bring the World Cup to the country where cricket is a great passion for crores of people. And, when you bring back the Cup, you will get the most enthralling reception in this city,” Gavaskar told Ganguly on his comeback to the Indian team by bagging the man of the series award against the Sri Lankans. Gavaskar was here to release the book ‘Sourav Ganguly — The Maharaja of Cricket’ written by cricket journalist Debasish Datta. Terming it as a “magnificent book about a magnificent cricketer”, the cricketing legend said before Ganguly came onto the scene the passion for the game in Bengal seldom translated into players getting through to the national team. “Of course, there was the great Pankaj Roy, who did so well for India in an era when there were no helmets. But otherwise, very few cricketers made it into the Indian team. “With Sourav coming through, so many young players have come up in Bengal. And, in time you will see many players representing India in international cricket,” he said. Gavaskar, however, said it was not enough to only earn the India cap. 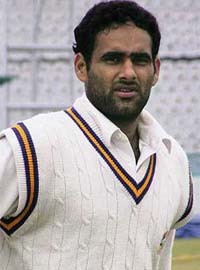 Further praising Ganguly, Gavaskar said he had a lot of similarities with the left hand willower. “Apart from both of us being Cancerians, we also have the same initials SG,” Gavaskar said. “But our biggest similarity lies in the passion we share for the game, in playing for India and in leading India. 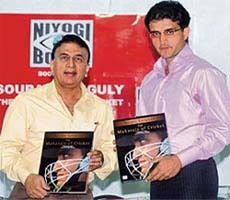 Gavaskar also acknowledged that Ganguly was a much more successful captain than him. “Nothing happens before its time. You look around at England and South Africa, who came back and showed great potential. You also have India, Pakistan and Sri Lanka who have been hosts. I think this is the best time for us. This is the time that we can really look forward to handle the World Cup,” Sobers said. Replying to a query, the 70-year-old Barbados cricketer player, who played 93 Tests, made it clear that he never played a limited-overs match. On how he would have played in the one-dayers, Sobers said one-day cricket would not have made much difference to his style because he was always an attacking player. It turned out to be the same old story for Gagandeep Singh. The name of the Punjab bowling spearhead was not there in the North Zone team announced yesterday for the Deodhar Trophy. Gagandeep was easily the most consistent seamer from North Zone. He failed to get the nod despite the fact that he has been bagging wickets in plenty and contributing substantially to Punjab’s cause for the past couple of years. The Ludhiana seamer came close to representing the country in Test cricket against Bangladesh in 2004, but unfortunately, he was shown the door without trial. Delhi’s Ishant Sharma and Gagandeep’s statemate VRV Singh have been selected. There has been talk of VRV being among the faster bowlers in India. But of late he has done nothing of note. As for Ishant, despite all the brouhaha about the young Delhi seamer, he remains largely an unknown commodity. Whatever be the reasoning, a reliable performer is bound to feel demoralised if his performance is ignored year after year. Thankfully, despite being repeatedly overlooked, Gagandeep has been keeping up his motivation level and not allowing his performance to dip. The selection of Sarandeep Singh and overlooking of the performance of Rajesh Sharma looks baffling. Rajesh took 17 wickets in three Duleep Trophy matches recently. He was at his best in the Duleep Trophy final and claimed eight wickets as North Zone beat Sri Lanka A to win the title at the Eden Gardens. Himachal Pradesh’s young batsman Paras Dogra has been in fine nick this season and was instrumental in the state graduating to the Super League for the next season. But he is yet to be tested while playing against tougher rivals as most of his runs have come facing bowlers of weaker attacks in the Ranji Plate group. The Deodhar Trophy starts on February 25 at Ahmedabad. North Zone will play their first match against Central Zone on February 27 at Ahmedabad. Squad: Gautam Gambhir, Shikhar Dhawan, Rajat Bhatia, Ashish Nehra, Ishant Sharma (Delhi), Karan Goel, Dinesh Mongia, Pankaj Dharmani, Bipul Sharma, VRV Singh (Punjab), Joginder Sharma (Haryana), Paras Dogra, Sarandeep Singh (Himachal), Yash Pal (Services), Abid Nabi (JKCA). Sushil Kapoor, manager (Punjab), Dr T. Pavan Kumar (physiotherapist). Wimbledon will pay women and men equal prize money for the first time at this year’s grasscourt grand slam, All England Club chairman Tim Phillips said today. The tournament broke with its age old tradition to join the Australian and US Opens in paying equal prize money across the board in all events and in all stages of competition. “This year the committee decided unanimously that time was right to move to equal prize money and bring to a close a long progression,” Phillips told a news conference. Wimbledon had been criticised for years for maintaining a discrepancy in the prize money offered to its male and female competitors. Last year Roger Federer earned £655,000 ($1.28 million) for winning the men’s title while women’s champion Amelie Mauresmo took home $625,000. The All England Club had previously defended its stand by highlighting that women contested best-of-three-set matches while the men had best of five. The French Open introduced equal pay for their men’s and women’s singles champions in 2006 but remain the only major tournament not to offer the same prize money throughout the rounds. “When Wimbledon pioneered Open tennis in 1968, the ladies singles champion Billie Jean King got £750 and Rod Laver got £2,000,” Phillips said. “So the ladies champion got 37.5 per cent of the money that the men’s champion got. 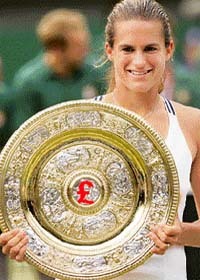 By stages that has moved up until in 2006 when Mauresmo won, the precise relativity was 95.4 per cent. So the champion was only getting 4.6 percent less. “We believe... it was time to bring this progression to a close and equalise fully. With the comprehensive win, the Dynamos collected three points to draw level with Chennai Veerans at 13 points. The match started on a dull note, but the Dynamos managed to take the lead in the 17th minute. Playing as a cohesive unit, the local favourites earned a penalty corner. Skipper Rajpal Singh pushed the ball towards Irshad Ali, who set it up perfectly for Jugraj Singh. The drag-flicker made no mistake to put his team ahead. After taking the lead, the Dynamos made repeated forays into the ‘D’ area of the Sultans. The team got another penalty corner after four minutes but Prabhjot Singh squandered the chance. They earned another penalty corner in the 27th minute but Jugraj failed to extend the lead. On the other hand, the Sultans, showing little zeal, adopted a defensive approach. In the 35th minute, the Dynamos made it 2-0 through Ravipal Singh. Prabhjot, who made several moves, dodged past Hyderabad defender Diwakar Ram and took a shot but the deflection off custodian Devesh Chauhan went to Ravipal on the right. 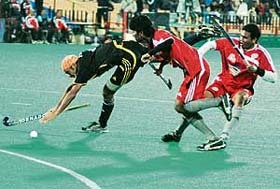 The Dynamos player executed a reverse flick that beat Chauhan. In the dying minutes, the Sultans went on the offensive. They earned three penalty corners (65th, 68th and 70th minutes) but the alert defence of the Dynamos thwarted all attempts. Jugraj sustained a bruise when an aerial ball hit him under the right eye. Prabhjot Singh was adjudged the Lion of the Day. Tomorrow, Cheenai Veerans will take on Sher-e-Jalandhar at 2 pm, while Maratha Warriors will face Orissa Steelers at 7 pm. Anand had a torrid time against the Russian, who held out well against the Indian’s relentless attack but lost track just before the first time control. The Russian GM lost an important pawn and eventually the game after 59 moves to give Anand his second successive win. The Indian now has three points and is half a point clear of second placed Norwegian GM Magnus Carlsen, who scored a fighting 60-move black win against Ukrainian Vassily Ivanchuk. Anand will next take on Armenian Levon Aronian, who split points with Hungarian Peter Leko, in the fifth round of the event. Giving this information to The Tribune, president of the North Zone CSR Reddy said the one-day tournament will be the basis for selecting a 12-member team for the inter-zonal to be held at the Qutab Golf Course, Lado Sarai, New Delhi, on March 17 and 18. The All-India Civil Services Golf Society was formed with the view of promoting golf among the civil servants. Competitions will be held in Northern, Central, Eastern, Western, Southern and North-Eastern Zones. Senior Secondary Model School, Punjabi University, organised its 31st annual athletics meet here today. Director sports Raj Kumar Sharma was the chief guest. The meet began with unfurling of the school flag by the chief guest. Students presented a march past which was followed by an PT show. Nirmal Goyal, principal of the school, welcomed the guests and read out the annual sports report of the school. Raj Kumar Sharma congratulated the winners and appreciated the school for promoting sports with the same enthusiasm as was evident in academics. He advised the students to make sports an integral part of their studies. Sandeep Kaur, a class XII student who attended the World Fencing Championship camp in Paris, was awarded by the chief guest. Abhimanyu, Jindal and Pooja were adjudged the best athletes. Punjabi dance was performed by students on the occasion. Mr Baldev Singh Sandhu, dean colleges, gave away the prizes to the winners.